How about a fun sale in the Jewelry shop? We don't have these often, so this is extra fun. There will be a place to input the code at checkout, easy as pie. There are sooo many treasures tucked in there. High quality gems I hunt all over for. Lots of bangles are extra fun, don't you think? Baubles and baubles of happy choices. Many pieces have antique elements, or items I have searched high and low for, collecting along the way. A little impromptu sale, yay! You simply enter the code at checkout. There will be a box for typing it in. I am still in denial that it is December. It is warm and sunny here. I hear it might change this weekend. But I am loving these mild days! Hope you are having lots of December fun!! Pearls, rubies, citrine, candy colors, gold tones and more! So many collected and treasure hunted bits and baubles to share. Layers and layers, dangles, charms and glorious stones. Vintage and antique elements too. Sparkles, semi-precious stones, crystals, oh my! So many trinkets I have collected, some for years. And earrings galore as well. I just adore earrings, don't you? I took so many photos for each piece. I wanted to give a good visual. Every piece will be hard to part with. I make each piece as though it is for me. I try them on over and over, making sure I love them all. So, there is some color in the mix too. Rubies, peridot, iolite, citrine, garnets and charms too! Along with lots of pinks and greys and golds. Oxidized and antiqued elements a plenty as well. Such pretty minty and pink colors too. Pink + mint chalcedony, angels and key love. Lots of details and fun elements. I had to delve into my take on a Fortune Teller necklace. With oodles of semi-precious stones. Each with their own meaning and healing properties. Lots of pearls and metals too. Something for everyone me thinks. All now in my jewelry shop. I am a lover of all manner of jewelry. I have all styles for all my different moods. There might be a perfect treasure waiting for you. Photos & Jewels Coming Soon, Oh My! I am just finishing up taking hundreds of photos of jewels. Earrings, bracelets, necklaces and all sorts of goodies I have been making. 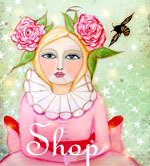 I am adding a huge variety of new goods to my jewelry shop. Rubies, amethyst, iolite, peridot, garnet - yumm! Such treasures I have searched high and low for to make lovely jewel treats. I am so excited, I never make anything without trying it on several times. If I would not wear it I don't make it. I wish the camera would do a better job at showing how fun all of this is in person. If you know me, then you know that I always wear a longish rosary pearl necklace with antique religious medals on it. I first made mine 15 years ago from some broken pieces I had. I have worn it nearly everyday since. No matter what I am wearing, I always throw on my necklace. Even if I have other necklaces on. It doesn't have a clasp, it just slips right over my head. Often people come up to me and just touch the medals. But I guess they feel compelled? Or, they ask me about it, or ask me where they can get one. I made a few to add to the jewelry shop as well. So, they will be a part of this rather huge update coming in the next few days. I just wanted to share a little peek. Show you what I have been up to. I got a little derailed by a bad eye allergy. Don't mow strange dry grass in the dark okay? Anywhooooo, I am sooooo excited about sharing these jewels in detail soon. I have about 40 hours of photo editing to do. But scrumptious jewelry pics are coming, and then I will start the process of updating the jewelry shop.